Business Etiquette Tips - Do I Have to Put Money Into a Tip Jar? 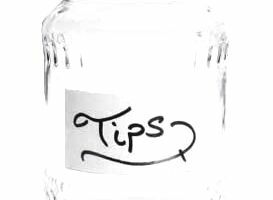 Tips About Tip Jars That May Surprise You! Question: Will co-workers or clients see me as “stingy” if I do not stuff bills into a tip jar on a counter? Do I have to put money into a tip jar? No, and no. You should not feel obligated to chunk your change into a tip jar and certainly not more than a dollar. Tip jars are nothing more than counter-top pandering. The haul is usually divided among co-workers who do not rely on tips (like wait staff do) for income and even shared with employees who did not provide you with any direct counter service. How Much Should I Add to a Tip Jar? Toss in the left over coin change if you want, but do not feel obligated to add bills. In fact, if you see large bills in a tip jar, chances are pretty good they were put there by employees or managers to encourage other people to match the fake tip. A one dollar tip is more than generous for tip jars and more than most people give. If you are trying to reward an individual for good counter service, your tip will be shared – not given directly to the employee you are rewarding. If you want to tip one employee in particular, give the tip to them directly – not the tip jar. Another way to show your appreciation is to take the manager aside and praise the employee’s performance. More customers complain than compliment so taking the time to thank someone for a job well done goes a long way. Write a thank you letter to the corporate office to show appreciation for management staff. A raise at review time based on good performance is worth more than tip jar pennies. How Much Do Employees Get From Tip Jars? I was curious about how much money staffers actually get from tip jars so I began asking employees at every establishment I frequented how much they personally got from tip jars at the end of each day. I was surprised to hear most employees got $5.00 or less. For the most part, your generosity is not making a big difference in a hardworking employee’s pocket. If you regularly visit an establishment it is nice to show support of the business by adding spare change or a dollar into a tip jar, but this is more of a positive statement that a true cash contribution. Never take money – even pennies from a tip jar - to cover your bill. Tip jars are for employees not customers. Taking from tips jars can be summed up in one word: Stealing. Do not put in a five dollar bill and then take four ones out for your change – if you need to change to add a small tip to a jar ask for it from the cashier. Consider tip jars optional tipping and a courtesy, not a mandatory gratuity. It is not considered poor etiquette in the business world if you do not add to tip jars. However, it is considered rude – not “networking” - to add your business card to a tip jar – do not do it!